a scientific study indicates that there is a correlation between the temperature of the brood nest in the bee hive and the wisdom of the bees. With higher temperatures in the brood nest, more intelligent bees are born. In honey bees, learning behavior and communication skills depend on several factors. Here the temperature at which bee pupae develop is crucial. If insects grow at a maximum of 34.5 degrees Celsius, they forget their learned knowledge more easily and perform less effective bee dances. The „more intelligent“ bees, on the other hand, develop from pupae that remain at 36 degrees Celsius, according to the zoologist Jürgen Tautz of the Biozentrum of the University of Würzburg in the new edition of „Proceedings of the National Academy of Sciences „(PNAS). Now the question is, what does this have to do with the size of the cells? 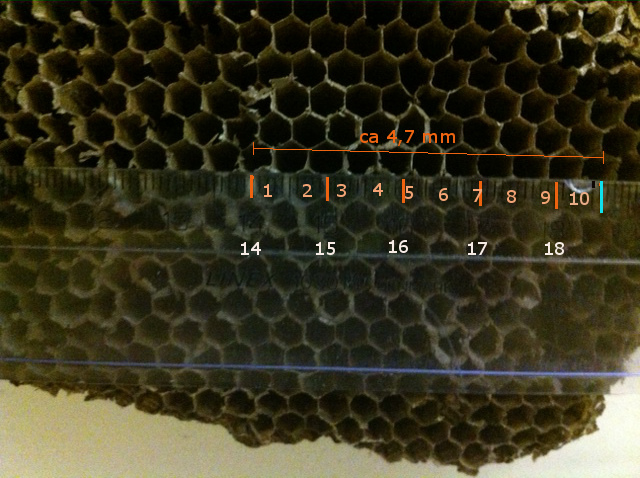 Small cell bees with a size of 4.9 mm have many more brood cells on the same surface and the space between brood combs is reduced to only 33 mm. Therefore, the nest of small cell hives is much more compact and the temperature in the brood nest increases. 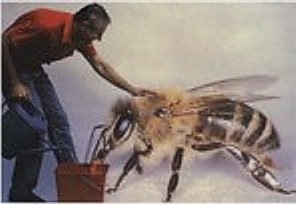 The result is that the incubation period of small cell bees is reduced by 24 hours. Can we conclude that small cell bees are smarter than large cell bees? It seems to me that we are getting closer and closer to the point, why the step back to a smaller cell size, as it was 100 years ago, has a great advantage for bees. Is it possible to say, that the artificial amplification of bee cells by the beekeeper, has led to a bee that is no longer as intelligent as it used to be and therefore can no longer survive on its own? The size of the cell inside the brood nest measures 4.7 to 4.9 mm.